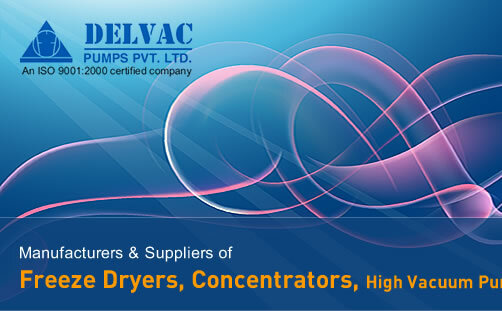 Freezer India, Freezer dryer India, Freezer dryer Accessories, Vaccum Pumps India, Vaccum Systems, India, Lyodel Freeze dryer, Lab equipment, Ultra low freezer, Food Processing, Delvac Pumps - Delvac Pumps Ltd, Chennai, India. This small bench top freeze dryer occupies very little space with an ice capacity of 1.5Kg. It is ideal for small volume drying and is cost effective. Mini-Lyodel is ideal for all freeze drying applications using 8-port column flask manifold as well as other accessories for vials and ampoules. Supplied with 100 LPM direct driven high vacuum pump. 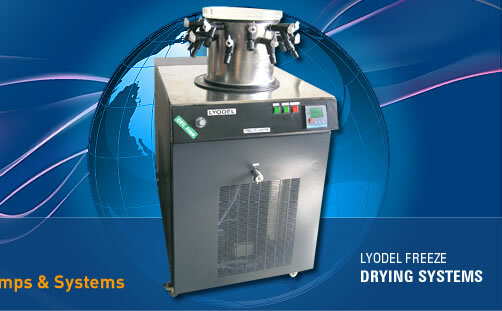 The Lyodel model having an ice capacityof 5 Kg is a multi purpose freeze dryer. It can be used with a wide range of accessories used for flasks, vials, ampoules and bulk samples. With vertically positioned ice condenser, this bench top Lyodel model is easy to use with a front positioned bottom drain. Control Panel has digital indication for both Condenser Temperature and Vacuum Pressure. Vacuum pump of 200 LPM is supplied with this model. Both mini-Lyodel and Lyodel are also available with trolley. Maxi-Lyodel is for high product volumes and long running time with an ice capacity of 18 Kg. It is suitable for multi-user operation in the laboratory or small-scale production. It has horizontal designed condenser and hot gas defrost system. With integral vacuum pumping, visible ice buildup and trouble free operation from interlocked controls, this unit is upgradeable to pilot plant. 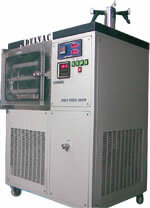 Delvacs' Lyodel Shelf Freeze Dryers are specially designed for flexible and reproducible production cycles. For precise control of freezing, primary drying and a secondary drying the unit has a microprocessor based programmable temperature controller with 2 relay outputs for shelf heating and cooling. Shelf temperature and product tray temperature are displayed. Keys are provided for changing the set programme as per the user need. For controlled freezing and drying of sensitive materials in vials or in bulk, Lyodel–Pilot Plant is the ideal choice. The unit is easy to use and has an integral refrigeration system allowing precise temperature control as well as reliable mechanical Stoppering. Maxi-Lyodel is upgradeable into Lyodel-Pilot Plant by addition of a 3-Shelf Refrigerated chamber with Stoppering mechanism. The 3-Shelf refrigerated unit is designed to fit on top of the Maxi-Lyodel base unit, with no additional requirement of valuable floor space. Single shelf loads can be stored, handled and ultimately slid on to this fence and tray accessory that is designed to maximize heat transfer by keeping the vial in direct contact with the shelf. Each stainless steel tray is capable of holding 2.5L of liquid. They are easy to clean, store and makes loading liquids very convenient.